Will the iPhone edition of PolyTune work as well as the pedal? Thanks to its polyphonic nature, TC Electronic's excellent PolyTune pedal gives guitarists the ability to tune all of their strings at once. Now the great (and slightly surprising) news is that this functionality is being packed into an iPhone app. This is currently in beta, and TC is inviting iPhone/iPod touch users to sign up for a public testing programme. The first 50 people to do so will get their hands on the pre-release version of the app and qualify for a free copy of the full version when it's released (providing they submit a test report, that is). Testing ends on 3 May. 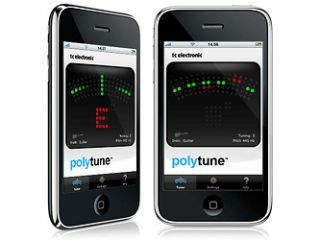 What we don't yet know is how much PolyTune for iPhone will cost, but if it's in line with other tuners in the App Store, it won't be much. And if it's cheap and it works, you have to wonder if TC will end up cannibalising sales of its PolyTune hardware. Time will tell; for now, let's just celebrate the fact that an iPhone version is on the way.